This year will see one of the biggest changes to Formula One's engine regulations in the history of the sport. Each car will have two fewer cylinders than last year, Energy Recovery Systems (ERS) will become integral to performance and turbocharging will be allowed for the first time since 1988. Yet the new V6 turbos will be nothing like what has gone before in Formula One and, best of all, nobody knows exactly what's going to happen. The Kinetic Energy Recovery Systems (KERS) we have become used to in recent years will be replaced by much more powerful units, recovering not just kinetic energy but also heat. Unfortunately, it gives us two more acronyms to learn before we go any further. First up is the Motor Generator Unit - Kinetic (MGU-K), which is similar to the KERS we've known in Formula One since 2009 but twice as powerful and capable of releasing energy for 10 times longer per lap. The second part is Motor Generator Unit - Heat (MGU-H), which harvests less power than MGU-K but is of equal importance as it works directly with the turbocharger. MGU-H acts as a generator to absorb power from the turbine shaft and, therefore, recover heat energy from the exhaust gases. The electrical energy can be either directed to the MGU-K as extra power boost or to the battery for storage for later use. However, when acting as a motor, MGU-H is used to match the speed of the turbo to the engine and cut out turbo lag. The new ERS will produce 160bhp of the overall power (estimated to be around 760bhp), making it significantly more important to lap time than in previous years. It's a complex new era, but fortunately Renault Sport's deputy managing director Rob White and head of track operations Remi Taffin were on hand at the end of last year to shed some light on the major talking points. There's no shying away from it, there will be a lot of reliability issues in 2014. The new engines represent a huge step into the unknown and there are only three weeks of on-track testing before the cars race for the first time in Australia. Things could get messy. White: "We need to address head-on the fact that this is a big change. Everything that we associate with immaturity in the regulations will be present, so the starting points [between the engine manufacturers] will be a little further apart from each other than it was. The fact is these are complicated systems. We will be ready to race come March, but the race-readiness I'm talking about is probably going to be a bit less sorted and a bit less stable [than in previous years], so we should be realistic about the fact that, while we are aiming for the same level of reliability, there is more risk. So there are several things, particularly at the beginning, which will increase the probability of unexpected outcome." In 2014 F1 cars will have to complete the same race distances as they did in 2013 but with just 100 litres of fuel. That's roughly 35% less than was used in 2013 (depending on the circuit) and presents a serious challenge for engineers. However, Taffin says it is not likely to see drivers coasting towards the end of races due to a lack of fuel. Taffin: "Maybe 30 years ago it was not that easy to get it on target, but obviously we had to rely a lot on the drivers - they had the fuel level on the steering wheel. Now we have everything on board and it's going to be quite automatic in the way the software will be dealing with the fuel. We anticipate many strategies we could achieve, but for sure we should not be in a situation where one driver has to lift off and become three seconds a lap slower because we did not anticipate the fuel. Pre-event we will run the race as we do these days with strategy for tyres and fuel, and then figure out the best strategy for the race. We should not see plus or minus three seconds per lap due to the nature of dealing with the fuel. It should be invisible. "At some races we are not expecting to be using that much fuel. In the case of Monaco, the optimum lap time will not come from carrying 100kg of fuel, whereas a track like Monza we will have the fastest race with maybe three or four more kilogrammes. We will have to find the right compromise." Turbo engines produce significantly more torque than naturally aspirated engines, but the delivery of the torque can lag behind the application of the throttle. One of the great challenges of the new power unit is to reduce turbo lag to near zero by using the MGU-H to power the compressor while the turbo reaches full boost. 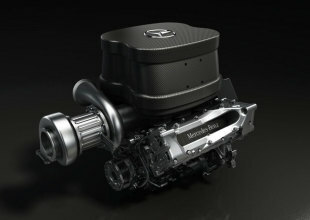 White: "It's a slightly unusual engine architecture with a single big turbo. If we didn't have the electrical boost then the turbocharger lag would be absolutely catastrophic. In the 1980s the big single turbo was already an unfavourable solution, with turbo lag in the order of several seconds. We've added a big turbo because we need it, but [without the MGU-H] the lag would probably be several tens of seconds, which is completely unviable." 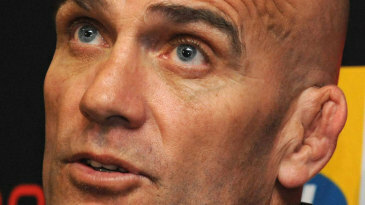 Taffin: "What we are going to try and get is exactly the same behaviour as we had with the V8 engines. It must be transparent, because if you have any delay or inconsistency with the delivery of the torque it's going to be a massive influence on the lap time. I think the most challenging thing for these engines next year is taking the lag out of the turbo." Although the engines are smaller next season the cooling requirements are much higher. 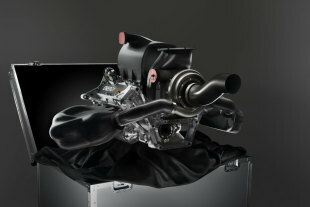 Early images of the Renault Sport ENERGY F1-2014 power unit showed a huge intercooler to feed the turbocharger, plus extra cooling needed for the ERS. This will not be welcome news in the aero departments of the teams, where cooling means bigger radiators and bigger openings in the bodywork. Taffin: "There is a lot more energy to get out of the power unit, but it's something we have been working on for a long time now. The work we are doing with our customers is very good and we know how to achieve this. Then it is more a question of getting the right trade off. You can get a lot of energy out of the car to make things cooler but then you need bigger radiators and so on. We have tested this on the dyno, we do not run a car on the dyno, but we have everything that the power unit is needing. We have the intercooler, rads and everything is on the dyno. But the actual trade-off is made in between our customers and us and we are not looking at the most power, we are looking at lap time. With the V8 we had a very good trade off and we know exactly where to put things, it's now a bit of an unknown for us. But that's the trade-off we need to assess." Although there was a development freeze on the old V8s, manufacturers were still tinkering with software last season to get as much performance as possible from the engines. Despite all the new hardware for 2014, once again it will be the software engineers pushing the boundaries all season long. Taffin: "The software is going to be the key factor for performance. You could run the engines next year in a very simple way but it's not going to be efficient. The software will again be key and we will need these things to work, because if they are not working to plan then when you get in the race it will be hurting lap time quite a lot. The hardware is frozen by March 1 when we give the specification to the FIA and the software will be the one thing where we can keep developing into the season. That is where we are going to get the performance out of it, because we have a certain type of hardware that we will anticipate we will be running at one point, but maybe when we get to Melbourne we will not be right there. Then you will see performance developing through the season and maybe 50% will be coming from the way we manage this." One of the most exciting aspects of the 2014 regulations is that it shifts the emphasis ever so slightly away from aerodynamics. For the first time this decade engine departments will have the opportunity to innovate and compete with one another over the coming years. Taffin: "It's going to be frozen by the end of 2019 so it gives the engine manufacturer five years to develop. For sure there will be different levels by the time we get to Melbourne, but by the end of the first year we will already be levelling in terms of power and competitiveness. The scope of changes that we can achieve through the first two winters is quite big. Anything you would have done in a different way you can change for the year after. The idea is that by the time we get to 2019 we should have a levelling as we saw with the V8, but again we will still have the software being developed. The regulations are trying to achieve some much more efficient engines, so we need to fix the hardware first and fit all that technology into the car, and then after we will start focussing on the software and how we use them."